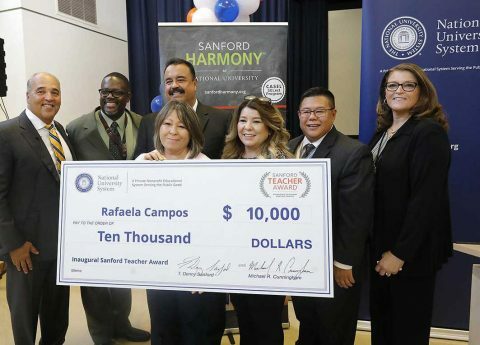 San Diego, CA – In recognition of teachers who inspire students to achieve their greatest potential, National University Systemhas launched the Sanford Teacher Award, a half-million dollar award campaign to honor 50 of the nation’s top inspiring PreK-12 teachers. The first-of-its-kind Sanford Teacher Award seeks to recognize the value of inspiring teachers nationwide by recognizing educators for their dedication to creating inspirational and harmonious classrooms that support student development and achievement. The Sanford Teacher Award will award the top inspirational teacher in each state with $10,000, with the exception of one top teacher who will be named a national winner and receive a grand award of $50,000.